The Saga's Not Over: South Africa Issues Arrest Warrant For Grace Mugabe Zimbabwe's former first lady allegedly beat a model with an extension cord, though for nearly a year she had diplomatic immunity. That shield was dropped, and authorities say they're back on the case. 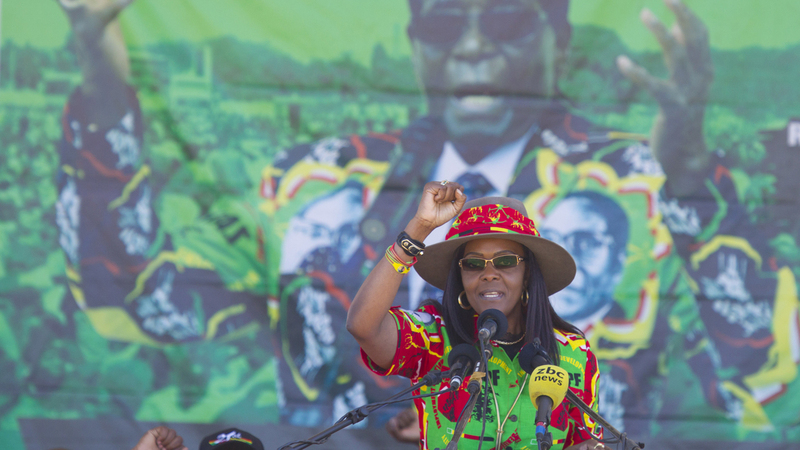 Grace Mugabe, then Zimbabwe's first lady, greets supporters at a rally last year in the city of Lupane. South African police now want to see her arrested for allegedly assaulting her son's girlfriend. South Africa is not done with Grace Mugabe yet. In another twist to a saga fit for a small-screen soap — but writ large on the international stage — the country's authorities have issued an arrest warrant for the former first lady of Zimbabwe. They want her in custody for allegedly assaulting a young woman in a Johannesburg hotel room last year. "When Grace entered, I had no idea who she was," South African model Gabriella Engels told local media in August 2017. Mugabe's two sons had been reportedly staying in a room nearby, though it remains unclear what prompted the alleged attack. "She walked in with an extension cord and just started beating me with it," Engels said. "She flipped and just kept beating me with the plug. Over and over. I had no idea what was going on." That was just the start of the drama. After failing to locate Mugabe, South African law enforcement raised a "red alert" for her at its borders — only for the country's foreign ministry to grant Mugabe diplomatic immunity and allow her to return home days later. More turbulence awaited her there. Months later, her husband, Robert, Zimbabwe's longtime president, found himself forced from office — at least partly due to fears that the nonagenarian strongman was planning to hand power to his unpopular 50-something wife, whose notoriously lavish lifestyle had earned her the unflattering epithet "Gucci Grace." In late July 2018, just days before Zimbabwe held its first major elections since her husband's ouster, South Africa reversed course. A court overturned the government's decision to grant Mugabe diplomatic immunity, reopening the possibility of her arrest. Now, South African police are once more pursuing her. "This is the result of a very long process," said Kallie Kriel, CEO of AfriForum, an advocacy group that has pushed for Mugabe's arrest. "AfriForum first had to approach the court to have Mugabe's diplomatic immunity set aside which paved the way for the police to investigate and it has now reached a point where an arrest can be made." "We hope this sends a very clear message that no one is above the law," Kriel added, "even if your name is Mugabe." Still, it remains unclear just how much success South African authorities can expect. Zimbabwe's newly elected president, Emmerson Mnangagwa, reportedly told his supporters recently that the former first lady and her ailing husband were in Singapore for treatment. A South African Police Service spokesperson told CNN that the country's law enforcement is trying to enlist Interpol's help in the hunt. Zimbabwean authorities have not yet commented publicly on the matter.